This soup is one you can make with your eyes closed and your hands tied behind your back so if you have gotten yourself in an unusual fix such as that then this is the soup for you. This lick-the-bowl-clean mushroom soup is memorable. I know, it looks kind of hideous. Trust me, it was no picnic to photograph. Mushroom soup is no beauty unlike my Cover Girl Beet Salad. It’s more akin to the Beast than anything else, but when you dive in with your spoon and take a taste, you will know that its ugliness lies solely on the outside. It tastes like a walk in the woods after a rainy day or a night by the fireplace of a rustic, log cabin. It’s cozy, rich, creamy and absolutely the most perfect answer to a night in. It can stand alone or go along side your favorite grilled cheese sandwich or panini. 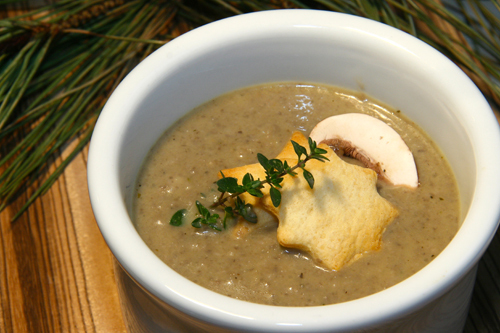 As if flavor isn’t enough to sell you on this earthy mushroom soup, its ease of preparation should cinch the deal. It’s so simple it’s embarrassing, but what girl doesn’t need a super simple soup in her repertoire? I’m afraid I must confess that I am a mushroom washer though. I know that is a culinary faux pas and mushrooms are to be gently brushed with a mushroom brush or simply wiped off with a towel. But I am a bit of a germ-phobe on any given day, and physically seeing dirt on my mushrooms is an immediate signal to use water. Don’t worry, I just give them a gentle rinse and pat them dry with a paper towel so they don’t get soggy, and then I don’t have to narrow my eyes and speculate if the cracked pepper is really a speck of dirt. That makes me happy. If you make this soup, I have a hunch that you will be happy too, and then everyone is happy, happy…even if it’s flippin’ freezing out there! Oh—you may want to have on hand a good loaf of crusty bread as well; it couldn’t hurt, could it? Makes ONLY four large-ish bowls and that’s it so if you want more, please double the recipe. I rarely make a single batch. 3 1/2 c. of either chicken broth, no-chicken broth or mild vegetable broth if you would like it to be vegetarian. Ok…I first de-stem my mushrooms and rinse and pat them dry and rub off any left on dirt. If you would rather just brush or wipe your mushrooms clean, be my guest, but that kind of risk-taking is just not for me. 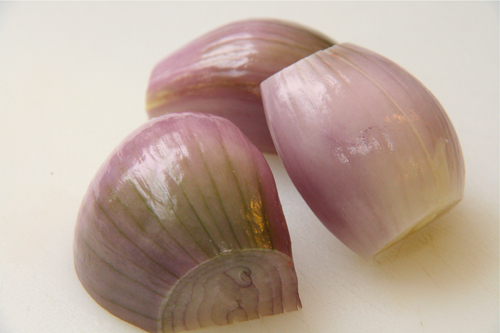 Chop your peeled shallots and garlic in the food processor or chop finely by hand. Remove from the bowl and reserve. Mince your thyme by hand. Set aside both the chopped shallots and the thyme. 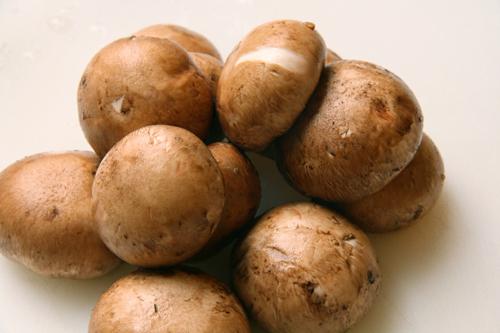 Clean and de-stem your button mushrooms. 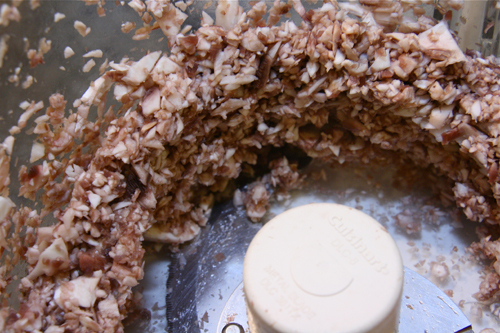 Throw 1/2 of your button mushrooms in your food processor or chop by hand. You want the mushrooms chopped into bits (see photo in post above of chopped mushrooms). Remove the chopped mushrooms from the bowl and finish off the chopping of the second half of your button mushrooms in the food processor. Go ahead and add half of the portobellos to your food processor as well. Chop together. Put the olive oil and butter in a large pot or stockpot over medium heat. Stir so you grease the entire pot and the butter gets dispersed. Once the butter has melted, add your shallots and saute until soft (about 3 minutes). Add your thyme and saute thyme as well. Add you flour and saute for a minute. Finally, dump all of your chopped mushrooms into the pot and stir frequently so that all of the mushrooms get cooked evenly. Cook for about 5 minutes. Pour in the soup stock, stir and bring to a low simmer over a medium heat for 15 minutes. Make sure when you stir, to scrape the bottom of the pot so that all the nice stuck on bits get worked into your soup. Those are tasty. Now either use an immersion blender (best tool ever) to puree your soup or pour your soup in batches into a blender and puree. SAFETY FIRST: Pour small batches of the HOT soup into the blender and CLOSE THE BLENDER TIGHTLY, but leave the middle little cap OPEN and use a towel folded over to cover the opening. You don’t want to splatter hot soup on your face but you don’t want a mini explosion either. Letting air out of the blender by keeping the middle portion open is key to not having an explosion. Once the soup is entirely pureed, pour the soup back into the stock pot and add the milk. Stir over a low heat. While your soup is heating back up, slice the reserved portabellos and saute with 1 tablespoon of butter in a small saute pan. Use these as garnish in each bowl of soup with a small sprig of thyme. If you wish to fancy up your soup for company, cut small cookie cutter shapes (stars or such) out of defrosted puff pastry and bake according to package instructions. Usually it will be about 10 minutes at 350 degrees. If I were you, I would do this while my soup was simmering so that they are ready when the soup is done. 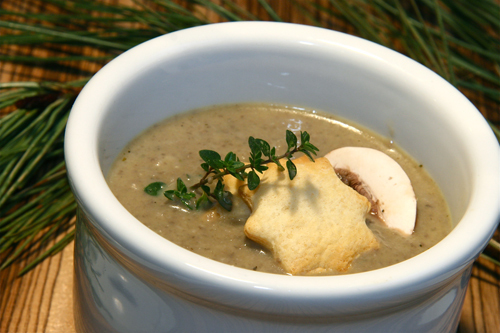 Sprinkle the puff pastry shapes, sliced mushrooms and sprig of thyme atop the soup for finesse. Geni, this sounds so wonderful right now because I am freezing here in AZ today. Ok, it’s probably only 60 or so, but for me, that’s COLD!! I have to admit that I’m jealous that you’re doing a repeat. What a great idea! I am ALMOST to that point, only 22 days left until I can do salads, soups, and other things that won’t require me to turn the oven on. I’m sure my husband will be pleased with the decrease in our electric bill! Have a wonderful Wednesday, my dear! You’re right, Geni, mushroom soup, and its preparation, certainly won’t produce the best of photos. Even so, the soup itself is one of the most flavorful and your recipe here is a keeper. Thanks for sharing. I am definately going to make this soup! I will substitute unsweetened soya milk to avoid the lactose. Love the puff pastry garnish! Yum! Well, I’m so glad I didn’t skip over this one (just came from your lemon souffle) some dishes are sooo difficult to photograph! But you’ve done a great job and I can tell from the ingredients this would be fantastic! We had a dip in temps to the 50s! Aren’t we a spoiled bunch of gals complaining about our weather!! This does look warming and comfy!! I’m so not a mushroom soup fan – childhood trauma, let me tell you. But if you made it, I’m sure it’s delish! I adore a creamy, rich, earthy mushroom soup. Thanks for sharing this one! I too wash my mushrooms and am a germ-a-phobe! I do love mushrooms but never attempted to make mushroom soup. 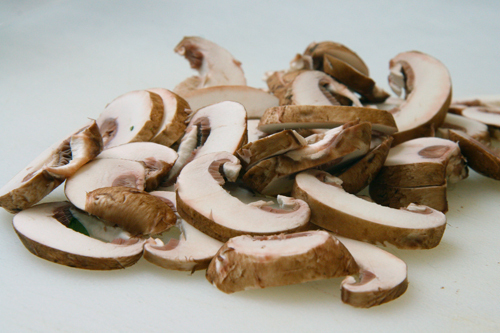 Mushrooms have some heart health benefits too! Thanks for sharing this warm and yummy soup! Reblogged this on My whimsical notes will have you spinning around me~. I have recently developed my love for mushrooms. The only one’s that we get in India are button mushrooms. I have to try this soup soon.